Welcome to Stop 21 and Chapter 21 of the Consequences Audio Tour! 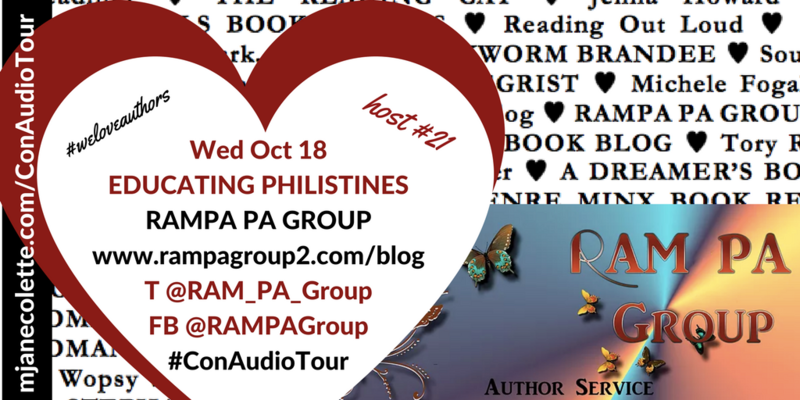 If you’re in a hurry to listen to Chapter 21: EDUCATING PHILISTINES, hurry over to RAM PA GROUP RIGHT NOW! Me: Run run to RAM PA GROUP to find out! Got a few minutes? Good. I really want you to meet today’s host, RAM PA Group, Maggie Lane and Ronni Bee’s endeavour to keep authors stress-free. RAM PA works hard for their authors, and I am so very very grateful Maggie and Ronni accepted my invitations to be part of the Consequences Audio Tour. I hope their clients and their readers enjoy the word play and body language in the “Educating Philistines” chapter, because… mmm. Yes. Connect with RAM PA Group​ on Twitter, Facebook, & YouTube. And make sure you head to their blog and listen to (find out how to read) Chapter 21: EDUCATING PHILISTINES. Man, you are working soooo hard. It’s amazing.